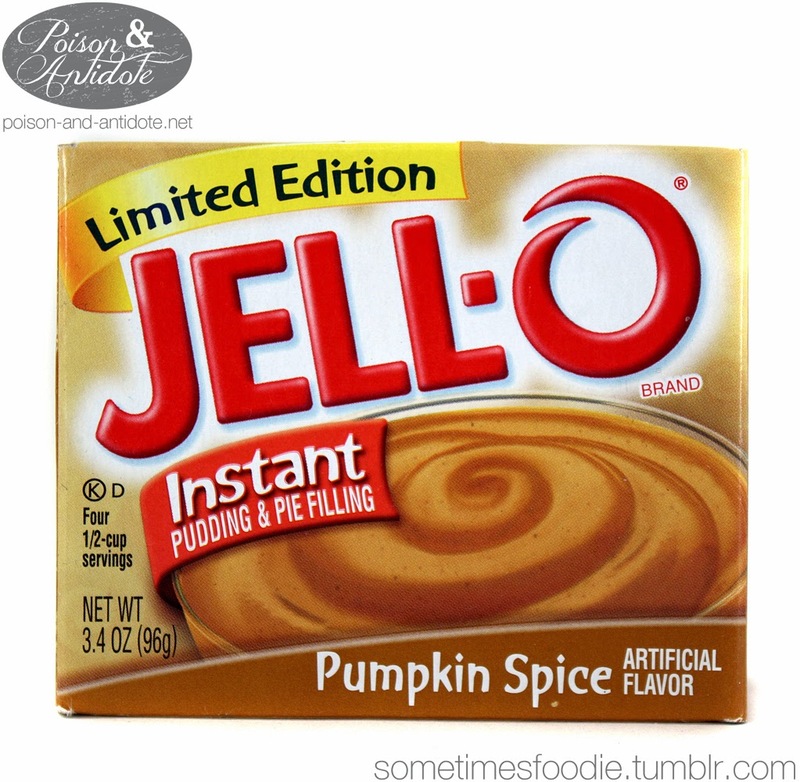 Sometimes Foodie: Pumpkin Spice Jello - ??? Pumpkin Spice Jello - ??? So... I totally forgot where I bought this. Maybe Wegman's? Target? I'm not sure, but I think this is a grocery store staple, so you should be able to find it at a lot of locations this season. We're finally at the end of my pumpkin haul! I will be posting some pumpkin coffees over the next two days, but that's it! Honestly, I am a bit excited to move on to other foods. I never thought it'd be possible, but I think I may have pumpkin-ed myself out. (*Gasp! *) Then again I have reviewed 26+ pumpkin items this season, which is even more than last year's haul. The box is pretty boring. 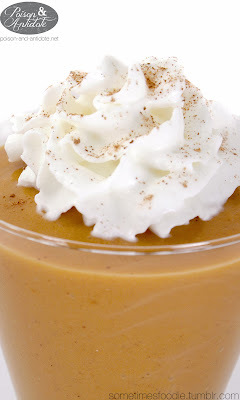 Actually, it looks a lot like Jello's butterscotch pudding. Since it's just a standard instant pudding box with a limited edition label, I won't discuss the design. I saw other boxes with scattered fall leaves, which were more festive, but I somehow missed the seasonal package. If you have never tried to make instant pudding, it's insanely easy. All I had to do was add two cups of cold milk to a shaker, pour the contents of the packet on top, and shake for 45 seconds. Talk about instant gratification. To class things up a bit I poured the pudding mixture into these fancy cups for photographing. Using fancy containers can really make a cheap dessert look a lot more sophisticated. If I had these out at Thanksgiving no one would ever know it was instant pudding mix! While I waited for it to set up I licked cleaned the shaker. The liquid-y mixture didn't taste like pumpkin spice at all! It was really cinnamon-y, which was yummy, but not what I was hoping for. After my mixture had set, the other spices became a bit more pronounced, but the cinnamon still reigned supreme. 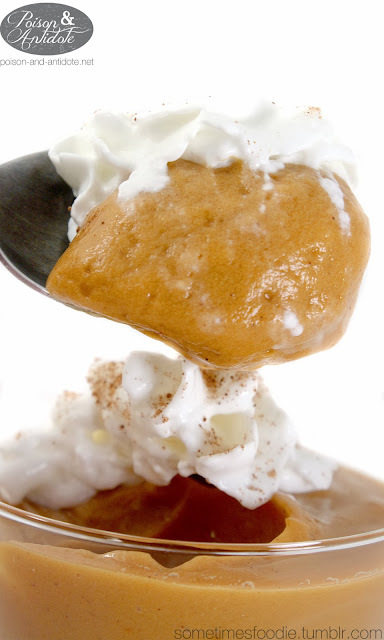 I topped my pudding with a little whipped cream and a sprinkling of pumpkin pie spice, which looked lovely, and it also brought out more of the nutmeg. The finished pudding is sweet and spicey, but it tastes more like a snickerdoodle than a pumpkin pie. I could see this dessert making a delicious base for an apple tart, or other apple dishes, but there is no way this will ever replace pumpkin pie. On a Pumpkin Scale of 1-5 (5 being the most pumpkin-y) I’d give this a 2.5. At first it tastes very cinnamon-y, but if you let it set up in the fridge the pumpkin spice flavors become a bit more balanced. I recommend topping this with whipped cream and a few shakes of pumpkin spice.